After gathering our things, we started the drive to NJ. My parents were nice enough to lend us their EZ Pass which helped us avoid all of the toll lines (and there are A LOT of tolls between MD and NJ)! We hit a lot of traffic due to storm debris and people flocking to their 4th of July holiday destination. We eventually made it and were very excited to get out of the car and hang out with family. Usually, we only come up about once a year (during Thanksgiving or Christmas) so it was nice to come in the middle of the year and see everyone. Eric really enjoyed catching up with his family. He even cooked and shared with everyone his pulled pork and grilled corn recipe. Yum! Towards the end of our visit, Eric convinced his dad and brother to help prep the car for the long drive ahead so they washed and waxed the car, changed the oil and air filter, and checked the tires. Our goal was to drive to Grand Rapids, MI and visit our good friends who just moved there from Atlanta. We left later in the day so we decided to drive to Cleveland, OH where we would sleep overnight before continuing to Michigan. Our driving break was in the middle of PA at the Penn State creamery (where Ben and Jerry learned how to make ice cream). 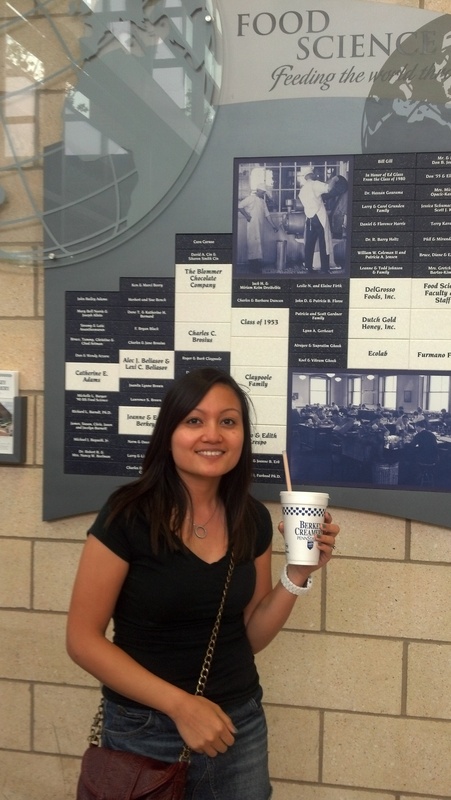 It was nice to have a stretch break and enjoy tasty ice cream milk shakes! We made it into Cleveland just in time to grab some dinner and sleep. Unfortunately, Sura made sleeping a little more difficult. Not only was she full of energy from sleeping in the car the whole time, but she is bred to be a watchdog so anytime she heard the slightest sound in the hotel she would bark and wake us up. While I appreciate her efforts to alert us of potential “dangers”, I really just wanted to sleep before having to wake up early for more driving. We spent another weekend a few hours south of Atlanta to attend a wedding. I was excited to visit since I’ve never seen that part of Georgia. We stayed in Peach County, basically home of the symbol representing GA…peaches! On the way down, we saw cotton fields, peach orchards, and farms known for their pecans. 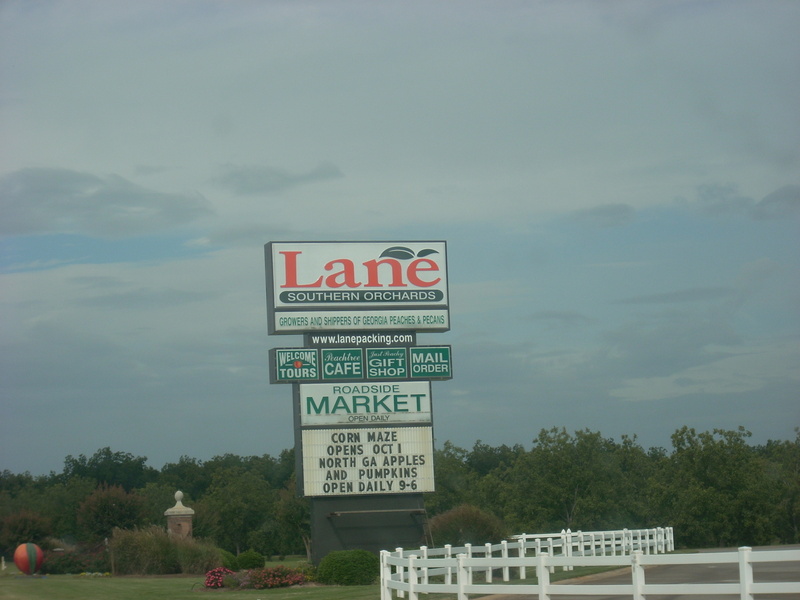 One farm in particular caught my attention, Lane Southern Orchards. It is a huge family farm known for their peaches, pecans, and other southern treats. Of course we had to make a stop there. We walked into the shop area where they had a small eatery. 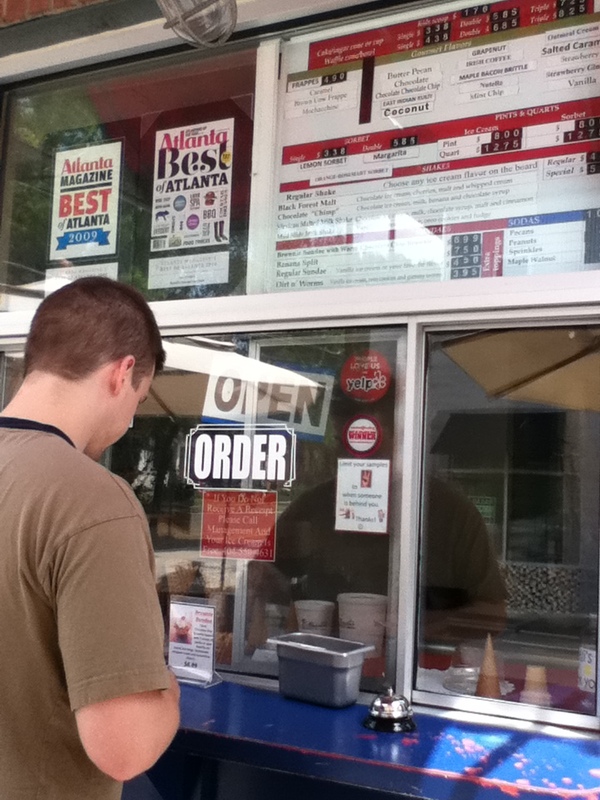 I saw a sign that they had homemade ice cream and immediately jumped in line for some peach ice cream. Those that know me understand that I have a serious ice cream problem. In fact, just the other week, I broke 2 ice cream scoops from overuse. Eric ended up with a pecan milkshake of some sort. Very tasty! I also picked up some bottles of preserves, marinades, and sauces all made on the farm. (Maybe I went a little overboard). This was definitely a stop worth taking for yummy treats. It’s too bad peach season is over. It would have been neat to see all the trees with the peaches. Maybe next summer we’ll come down and I can make my own peach ice cream! Whenever something bad happens, I always hear that I’m supposed to look on the bright side. Once I hurt my hand and could really only use 1 hand, I became very annoyed and frustrated at the whole situation. But, I soon realized some good things have come from it. First, a wrapped up hand makes for a great intro conversation with people I am just meeting. It gives us something to talk about besides awkward, silent conversation. Second, an injury brings out a polite side from complete strangers. Everytime I go to the grocery store, some random person shopping always offers to help me carry my things or get me something that I need. This could also just be because I’m in the south. Not so sure people back home in the northeast would be so helpful. Finally, I can pretty much ask for anything (well within reason lol) and get it! 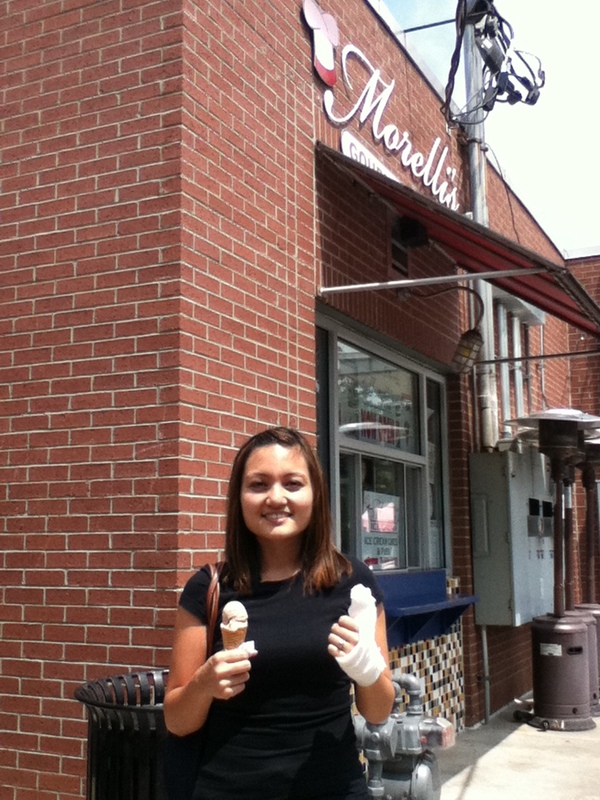 I decided to use my hand to convince Eric to take me to this ice cream place in Atlanta that I keep hearing about, Morelli’s. Ok, let’s be honest, Eric doesn’t really need that much convincing since he loves ice cream; almost as much as I do. Now those that know me best know that I have a soft spot for ice cream. Basically I have ice cream every night (I always keep a pint in the freezer), even in the middle of winter. Once we got there, I was overwhelmed with all the options. Morelli’s is a gourmet ice cream place making flavors ranging from originals like chocolate chip to more unique ones like coconut jalapeno. They are known for their salted caramel so I tried a sample and it was different from the High Road ice cream which I love but still yummy. I ended up settling on nutella. I was a happy gal after an ice cream trip and realized I just needed to focus on all the positives and not let my hand bring me down. Time for a sweet break from wedding posts. Eric and I decided to go on a little trip to High Road Ice Cream with a friend of ours. High Road is an emerging company specializing in craft ice creams and sorbet. For those in Atlanta, they are located in northern Atlanta, just outside the perimeter. We arrived in a small, empty office lot where there was a line of people standing outside a small building. As soon as we walked up, a lady began offering us samples of the ice cream they had available. I had a taste of the caramelized peach, green tea, and hazelnut ice creams. They were all amazing!! High Road tries to use local products and keeps the ingredients all natural. The list of speciality ice creams available ranged from french toast to red velvet to gin and juice.